…I am happy to certify that Mr. Toudouze has achieved all that his debuts promised, that he has not “fooled around” along on his way; that he has forced himself to understand the unfathomable mystery of art; that he matured through strong and constant studies; that he demanded from his ancestors, face to face with their work, the secrets of the perfection that they attained. This praise which could have appeared a banality fifty years ago, that artists then would have considered an insult, goes to someone we become aware of just by looking at his works, it goes to a sincere man, a delicate man, and a researcher. Nothing common tempts him; no mercantile consideration has made him deviate from his path. He practices “passive obedience” preached by the masters. He completed studies during his youth at a school in Sainte-Barbe. After leaving school he entered the atelier of his uncle Auguste Leloir and later also began studying under Isidore Pils, later becoming a student at the Ecole des Beaux-Arts. Throughout his Salon career he would recognize both artists as his primary masters. Pils was a leading academic painter who ran an atelier that prepared students for their entry in the Prix de Rome. This competitive competition occurred only every four years, but the winner was virtually guaranteed financial success upon return from his four year study in Italy. Before he could enter the Prix de Rome, however, Toudouze began exhibiting at the annual Salons. In 1867 he debuted, at just nineteen years of age, and embarked on a strong career exhibiting throughout Europe. This Salon entry was entitled Gaulois mettant une barque en mer (Gauls Putting a Boat in the Sea). In Rome, he felt among the immortal geniuses who would save Italy from final oblivion, a profound emotion. There he showed this great enthusiasm for the spirits of the elite before the most perfect emanation of beauty. Furthermore he was possessed with the desire to succeed and beyond that the thirst for human understanding. He was studious and a seeker, so much so that he completely seduced the elite intellectuals Hebert and Lenepveu, who took an interest in this young follower. After Italy, Toudouze fittingly concentrated his efforts to mythological and historical themes, which placed him in the middle of the quarrels between academic artists and others such as the Impressionists who wanted to challenge academic tendencies. Toudouze was very popular at the Salon and his works also were purchased by the Third Republic government for placement into many French museums. Toudouze was clearly following, like William-Adolphe Bouguereau, the path that was coming under fire, but which remained both lucrative and popular both with the public and with the state. One of these paintings that clung to a strict academism of mythological paintings was his 1874 Salon entry, submitted while he was still in Rome, entitled Eros et Aphrodite (Eros and Aphrodite). Maréchal described it as “an exact reflection of his character. The subject is full of fantasy…The idea was full of grace and the coloration extremely luminous.” (pg. 81) This work was purchased by the state in 1875 and placed in the Rennes Musée des Beaux-Arts, where it remains today. He continued exhibiting these types of compositions and earned praise from Théodore Veron that “Of the rest, with a master like Pils and M.A. Leloir, one could not be misled; and Mr. Toudouze is very near to becoming a master himself.” (Veron, Le Salon de 1876, Paris: Chez L’Auteur, 1876, pg. 111) He was speaking about Toudouze after viewing his 1876 Salon entry entitled Clytemnestre – Le meurtre d’Agamemnon (Clytemnestra-the murder of Agamemnon), which earned him a third-class medal. The following year, in 1877, he exhibited La Femme de Loth (Lot’s Wife) and earned his second medal, this time a second-class medal. Apart from these themes that became so popular, Toudouze also executed a number of compositions that were based on eighteenth-century life. 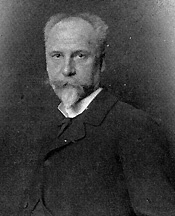 This phase came somewhat later in his career, allowing Montrosier to write in 1888 that “At present, we see Mr. Toudouze enter into his second manner and somewhat sacrificing antiquity to fantasy. From the historic or religious pages will succeed genre scenes of an ingenious manner and of a refined spirit.” (Montrosier, 3) His images evoked an understanding, or presumed understanding, of this period and relied on precise detailing to give it this feel. These themes were equally popular among their Third Republic audience who believed they were the heirs to this stylish way of life. Toudouze is also credited with having executed many of the popular illustrations of the time including: Woodstock (Woodstock), Les Adventures de Nigel (The Adventures of Nigel), Mademoiselle de Maupin (Mademoiselle of Maupin), and Chronique du règne de Charles IX (Chronicle of the Reign of Charles IX). He equally illustrated many works by great French writers such as Honoré de Balzac and Prosper Mérimée. At the Exposition Universelle of 1889 he was awarded a silver medal and was also named a Chevalier de la Légion d’Honneur. He also took part in International Expositions since La Berceuse (The Cradle), a print, was featured at the 1893 World’s Fair in Chicago. Ten years later, he became an Officier de la Légion d’Honneur. His popularity and public fame had grown, which brought him many commissions. One of these important associations was with the Gobelins tapestry manufactory which commissioned from him a portfolio of designs which would be made into tapestries. Today a ten piece tapestry from this portfolio, depicting the history of Brittany, adorns the Palais de Justice, in Rennes. 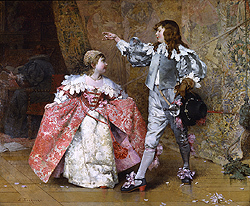 His work Le Jeu de Robin et de Marion (The Game of Robin and Marion) hangs in the foyer of the Opera Comique, and as recently as 1977 a painting of his was hanging in the ballroom of the Vanderbilt Mansion in New York. His final Salon entry was comprised of six paintings which were models for Gobelins tapestries. This was in 1907, the year of his death. Maréchal explained that “A fairly premature death, and certainly not foreseen, prohibited Toudouze from capturing all the honor that he merited for such considerable work crowning an œuvre already important in its value and diversity.” (Maréchal, 82) He died on March 13th, or 24th, 1907 in Paris. During his career Toudouze’s images had become popular with the state, the public, and with artistic organizations who wanted to associate themselves with his images, such as the Gobelins. He had become a painter, an illustrator, and a decorator, using themes ranging from historical to biblical to mythological to eighteenth-century genre. He also became a teacher himself and taught at the progressive Académie Julian, alongside Bouguereau, where the careers of many young and talented artists were often formed. 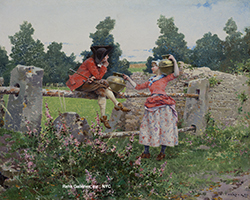 He remains a popular figure even today, and his images show the continuing interest in an academic style during a period in which many only remember the advances of the Impressionists, and other avant-garde artistic movements.